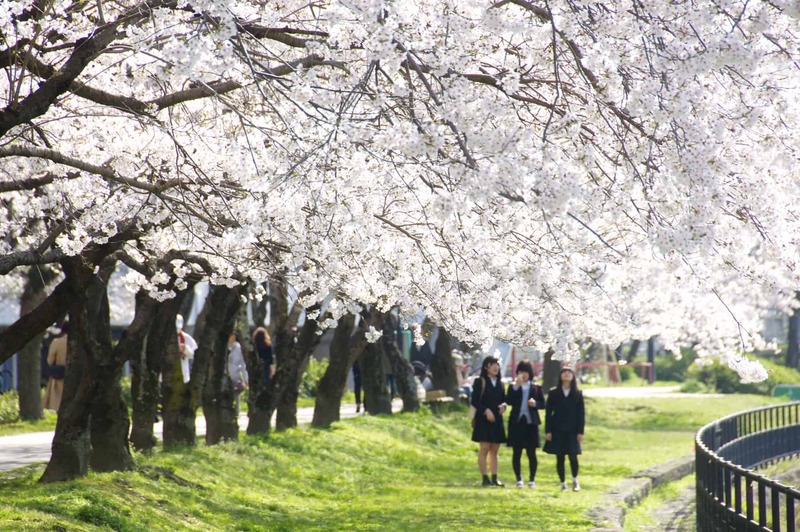 Although the last gasps of winter may make you think otherwise, come late March, spring is just around the corner, and everyone, from old ladies to young punks, is looking forward to the cherry blossom season. 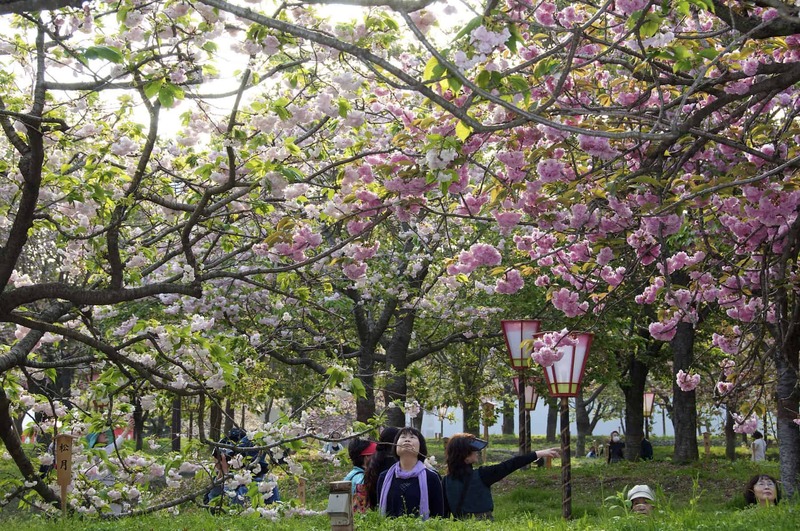 Here’s our guide to Hiroshima’s top hanami spots. Once buds begin to appear on the sakura trees, tako-yaki wagons start to roll up at top hanami spots and lanterns are hung from trees. 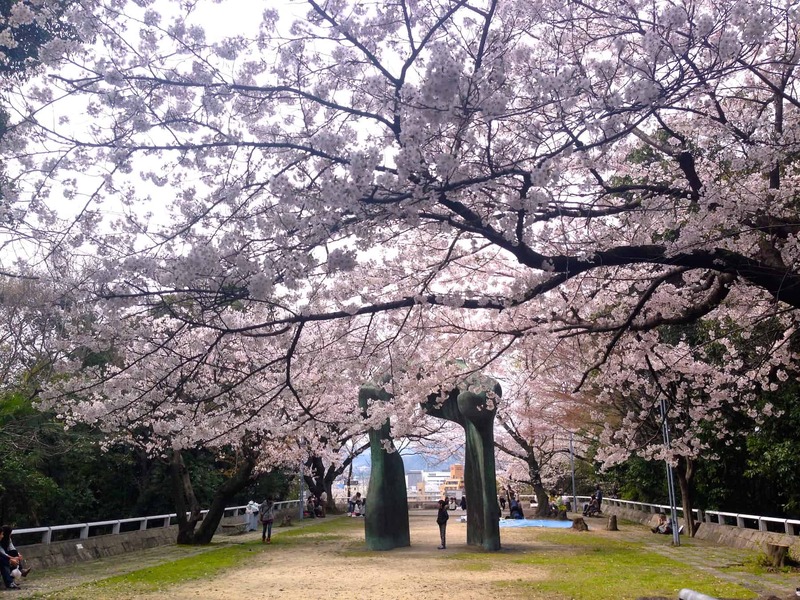 These places have the most cherry trees and are spectacular when the blossoms near the mankai full bloom stage. Their popularity can make for a cramped and often rowdy experience, but are also great fun. 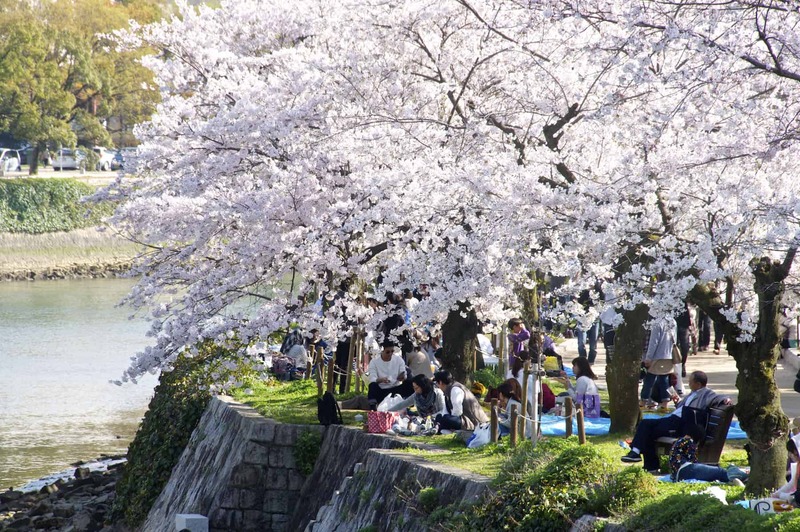 Ostensibly, an opportunity to admire nature’s beauty and contemplate its impermanence, hanami can be hard on the liver. You do see people sitting quietly enjoying bento boxed lunches, but drinking copious amounts of alcohol is often central to the experience. 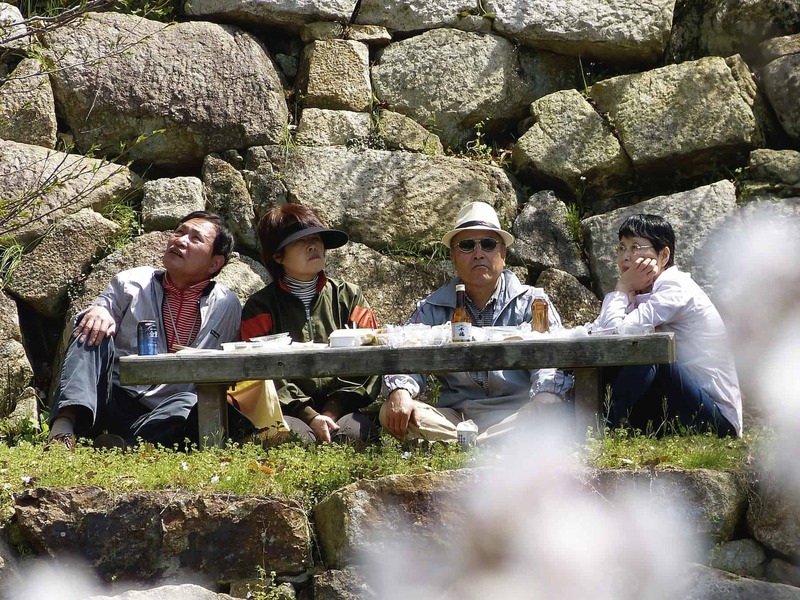 Some go to great lengths to ensure they get a good hanami location. The beginning of April is when newly graduated students enter the workforce, and for some one of their first duties is basho-tori. The sight of a solitary, fresh-faced employee sat in the middle of a huge plastic sheet from dawn till dusk, reserving a space until the rest of his colleagues show up after work, is a common one. Below is a roundup of the most popular places in and around the city where you can enjoy listening to karaoke that could seriously damage your health, avoid eye contact with the drunkest bloke in the park, and of course, reflect on the fleeting nature of life as petals fall, gradually covering the comatose. You can also download and print out our Hanami Map from here [PDF] . If it is peace and quiet you are looking for, it’s best to pack a lunch and seek out one of the many clumps of trees too small to be designated as a “spot”. 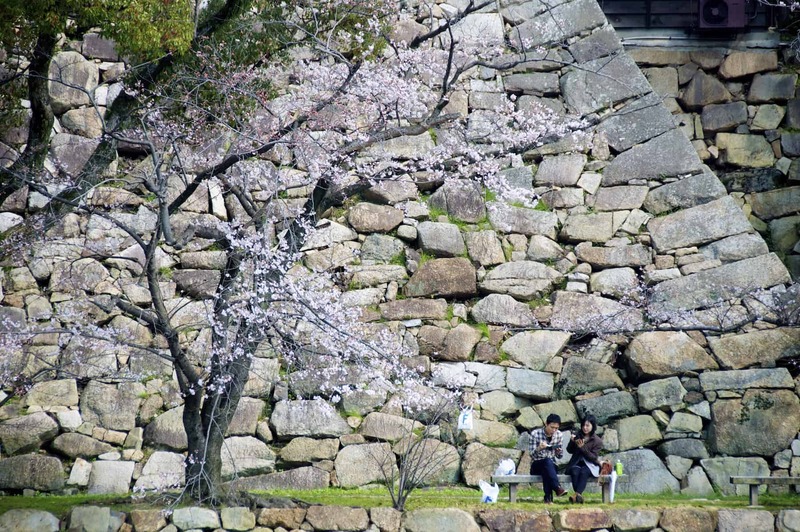 Many of these quieter areas can be found along Hiroshima’s many rivers. Or, alternatively, head for the hills in search of wild yamazakura. 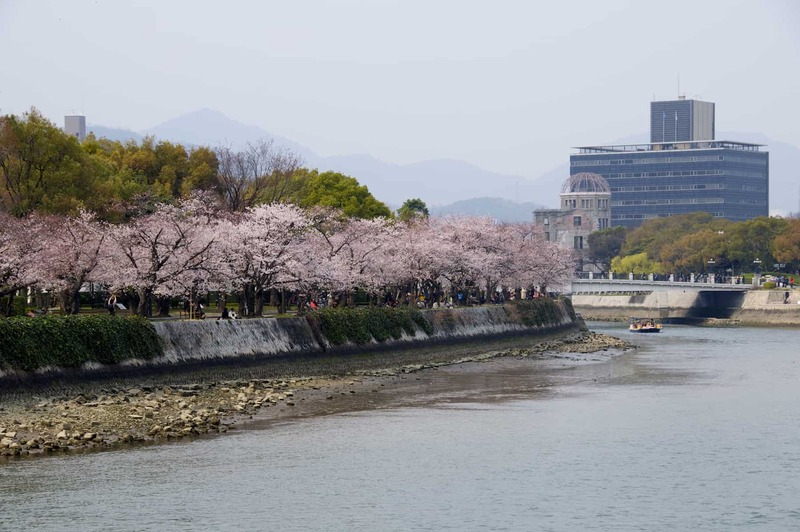 Its central location and the 300 sakura trees that line the banks of the Motoyasu River between the A-Bomb Dome and Peace Boulevard make Hiroshima’s Peace Park a very popular place for hamani. If part of a large group, on weekends you’ll have get here pretty early with your plastic sheet and defend it with your life to be assured of a decent spot. We should mention that some hibakusha A-bomb survivors find carousing on what they view as a mass grave to be in poor taste. From the crowds it is obvious that this is not a universally held view. However, it is advised that you don’t let yourself get too out of control here and pay particular attention to taking away your trash. 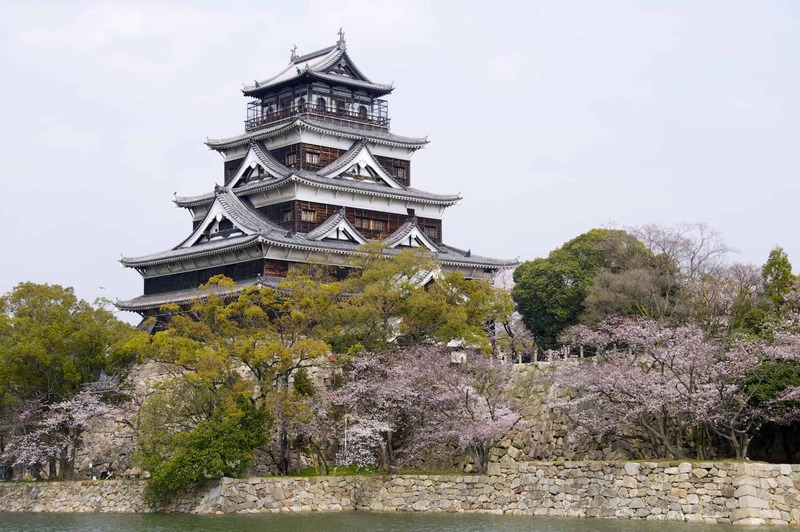 The grounds of Hiroshima Castle and the banks of the moat are a great place to view the 350 or so cherry trees that come into bloom in early April and it you can get some very nice “Japanesey” photos. 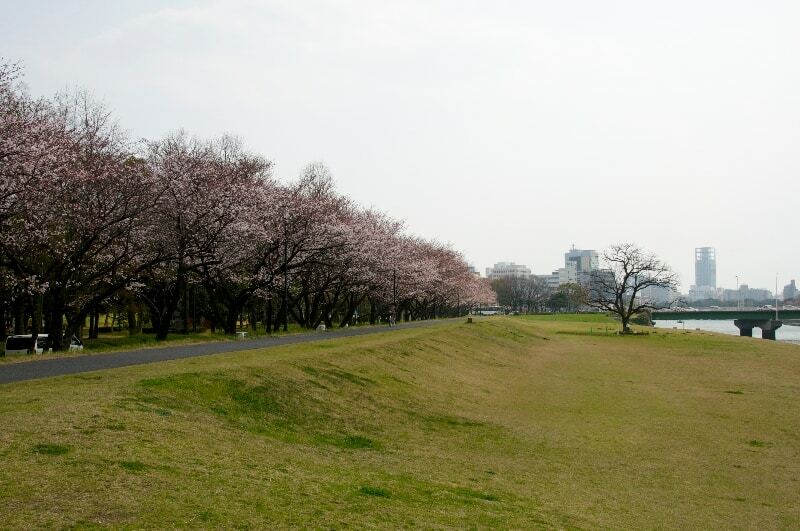 There are quite a lot cherry trees which circle the grassy mound in Chuo-park, but by far the best place here is the wide strip of grass running along the Ota-gawa on the west edge of the park, recently rebranded as POP’La Dori. The cycle/pedestrian pathway that runs alongside is lined with beautiful cherry trees. A favorite spot for local residents is this (usually) quiet stretch of riverside along the Kyobashi River. It basically runs from Kohei-bashi Bridge (near Big Wave sports center), is broken by Ushita O-hashi Bridge, and then continues down to Tokiwa-bashi Bridge just before the Shinkansen tracks cross the river. The road that runs just above the narrow park above the section between Kohei-bashi Bridge and Ushita O-hashi transforms into a cherry blossom tunnel, with the overhanging trees above and the freshly fallen petals on the road below – there’s no sidewalk though, and cars tend to fly through so take care. Sakura blossoms always look best on a bright sunny day against a clear blue sky, but Shukkei-en is one place where the somewhat unpredictable weather around hanami season can actually add to the atmosphere. 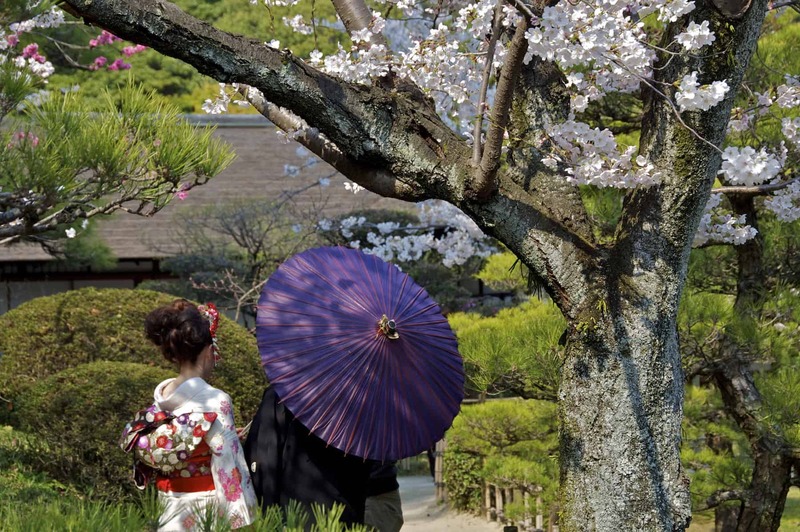 You can also enjoy the blossoms while drinking Japanese tea, and there are sure to be some lovely kimono on display at the annual tea ceremony usually held on the first Sunday in April. But, if you want to enjoy some quiet reflection, to which the park often lends itself, you should probably avoid weekends. 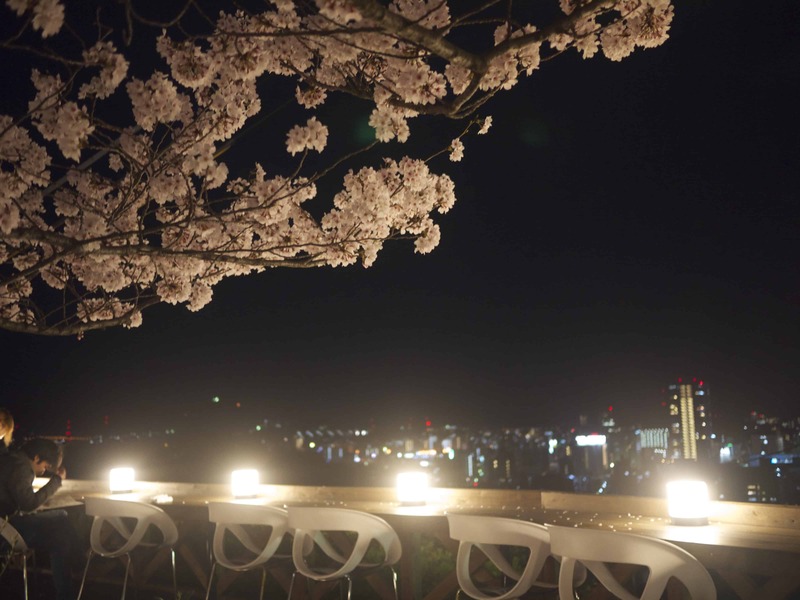 One thing not to be missed is the yozakura night viewing of the blossoms here. This time of year is also prime viewing season for newlyweds having their wedding photos taken in traditional dress. 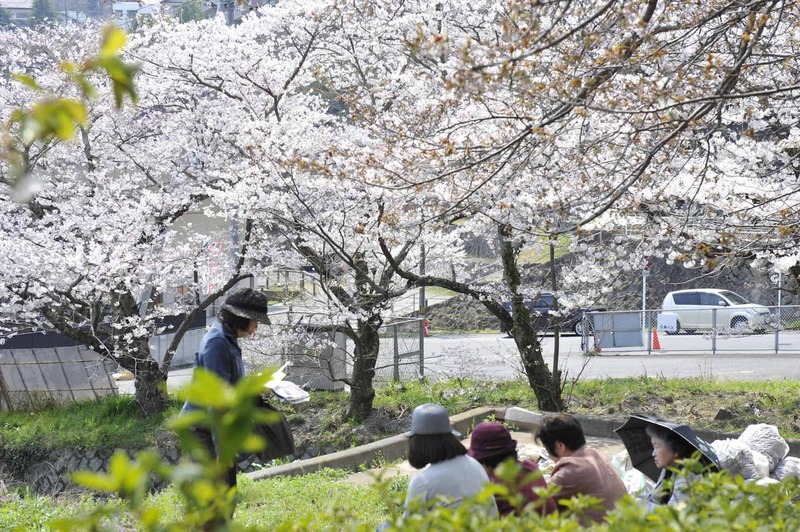 With about 1300 cherry trees lining the paths that weave their way around this hilltop park with good city views, Hijiyama is one of the top hanami spots in Hiroshima. The area around Henry Moore’s Arch, opposite HMOCA, from where there are good views over the city is a popular place for photos and the open space next to the Manga Library, though a bit barren is popular with families. You will, however, see people picnicking under trees all along the park’s winding pathways. Hijiyama is a yozakura spot and the lights mean it can get pretty lively at night, though you’ll be expected to leave the park by 11pm. Ok, so this isn’t in Hiroshima city, nor even Hiroshima Prefecture, but who are we to be bound by borders when it’s so close and so beautiful. 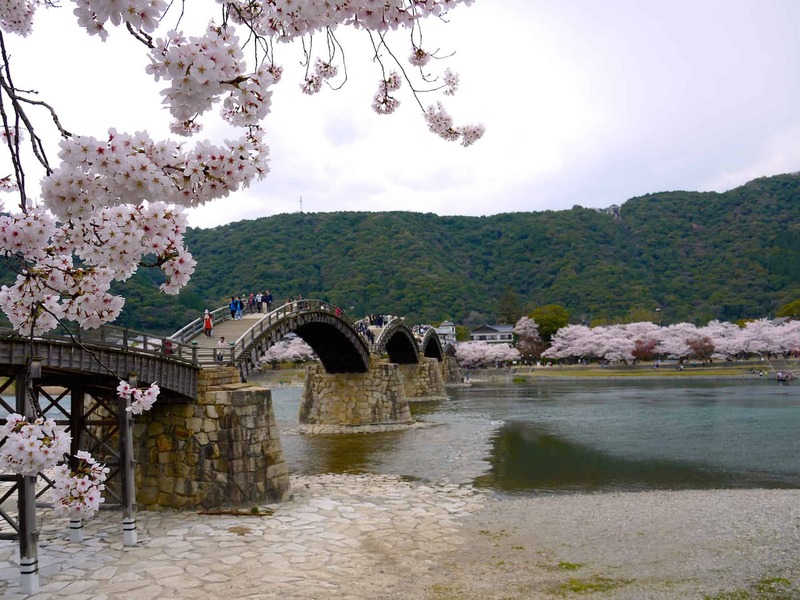 Plus, the arched Kintai-kyo Bridge was voted by GetHiroshima readers as their favorite hanami spots. Worth checking out a least once a year. Be sure to hang around to see the bridge lit up after dark. It’s even beautiful on a grey, rainy day. 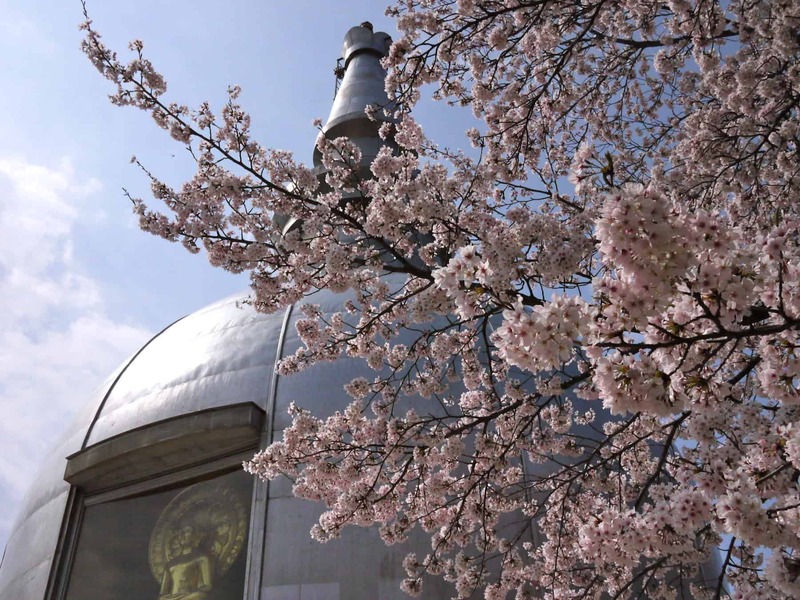 There are several large cherry trees on the flat piece of ground around the the silver Peace Pagoda that sits on top of Futaba-yama just north of the shinkansen station. It is a lovely place to picnic and there are fantastic views. 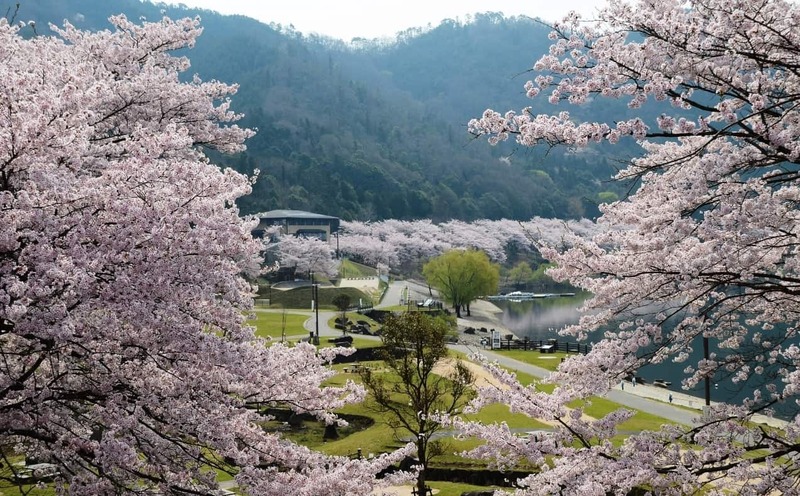 This is perfect for those who wish to combine a bit of hanami with a hike as the path up the mountain takes you under 100 or so vermilion torii shrine gates through a lovely forest. Just below the mountain is “Steak & Coffee” restaurant Mahogany, which has a spacious balcony shaded by some huge cherry trees which are gorgeous day or night. 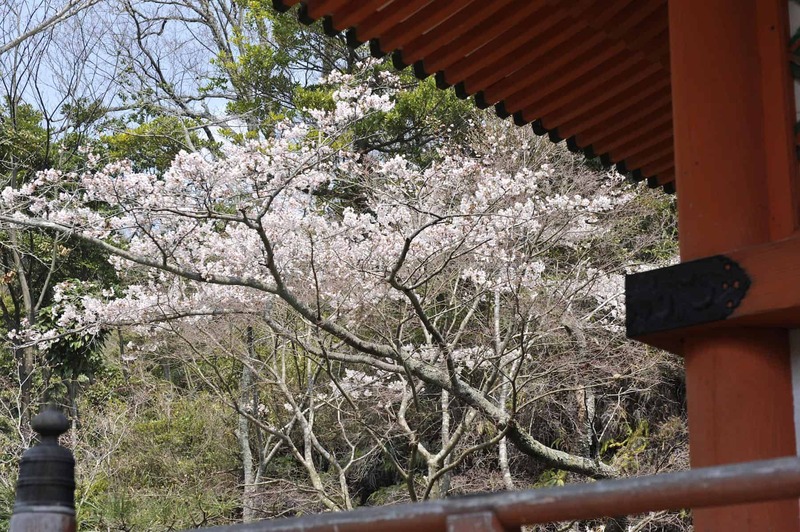 There are cherry trees dotted around the grounds of Mitaki Temple, and the view of the Tahoto Pagoda framed by cherry blossoms is particularly well known, but it is the upper end of uphill approach to the temple where the blossoms are most impressive. The usually nondescript little park (not much more than a square piece of dirt) explodes with white and pink blossoms and gets quite crowded with BBQing families. Mitaki is another place that is still very pleasant to visit even on a rainy day. South of the city center, Eba-yama Park affords views over the somewhat industrial southern end of Hiroshima city, the Inland Sea, Miyajima and the other islands. It is also lit up at night and has some pretty damn funky looking toilets. 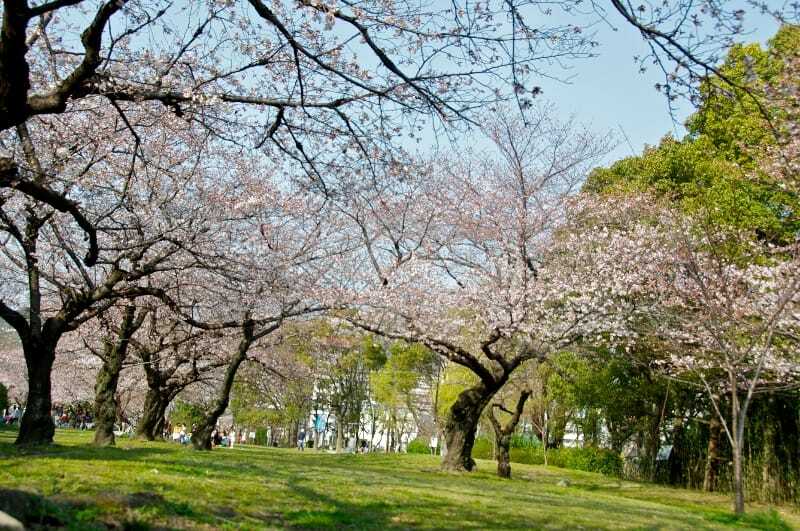 The park has only 150 cherry trees, but includes one that is very rare in Japan, discovered in 1944 and named the Hiroshima Ebayama-zakura. 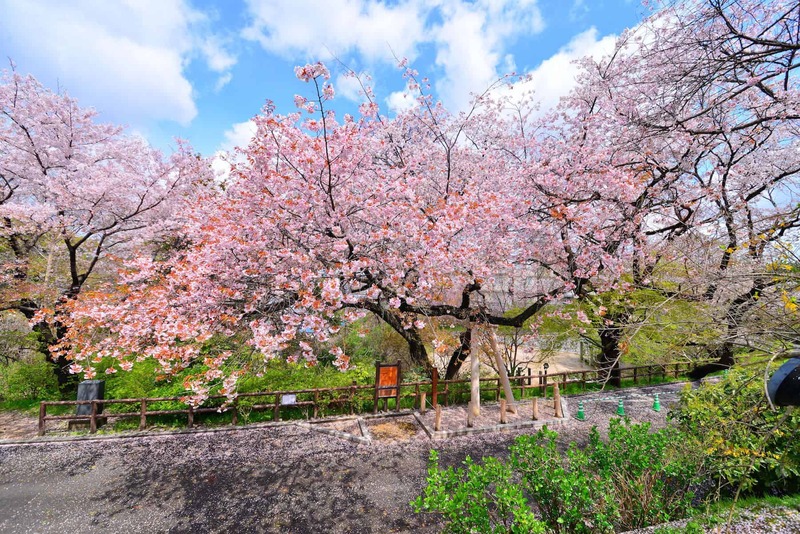 This hillside park, just under 3km from Hiroshima Station and the city center, is best known locally for its rose garden which blooms in late spring and in autumn, but it is also covered in large cherry tress that are laden with beautiful blossoms during sakura season. Considering the number of tress, the amount of nice places to sit (on the grass, under gazebos and on benches) Ushita Sogo Park is usually very quiet. Drink machines are on hand at a community run nature center, but you won’t find any stalls here. 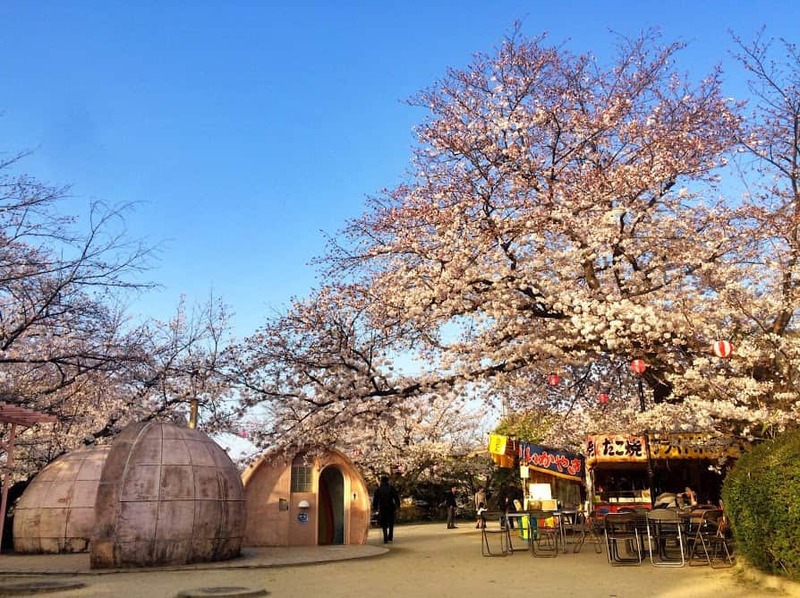 If you just don’t want to let go of that hanami feeling, or you find yourself in Hiroshima a week or two after the peak of the blossoms in the city center, there are places nearby where you can get another good cherry blossom fix. Don’t forget that the blossoms can look just as lovely on the ground as on the trees. For one week a year (April 13-19 in 2018), the Hiroshima branch of the Japan Mint in Itsukaichi, just west of central Hiroshima opens its gates to the general public to allow them to enjoy a huge variety – around 60 in all – of cherry blossoms, in all kinds of shapes and hues. The grounds are open until 8pm so you even get see them all lit up. And admission is free. More details here. 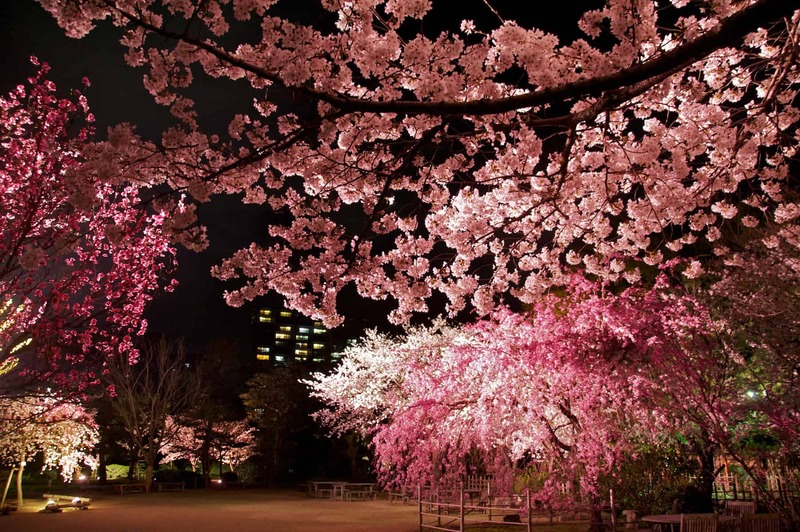 This manmade lake, also known as Yachiyo Lake, to the north of the city boasts around 6000 cherry trees, many of which are illuminated after sunset by around 400 lanterns and is a very popular hanami spot for families. They trees tend to bloom slightly later than in the city center and, depending on the weather, can hang around for some time. 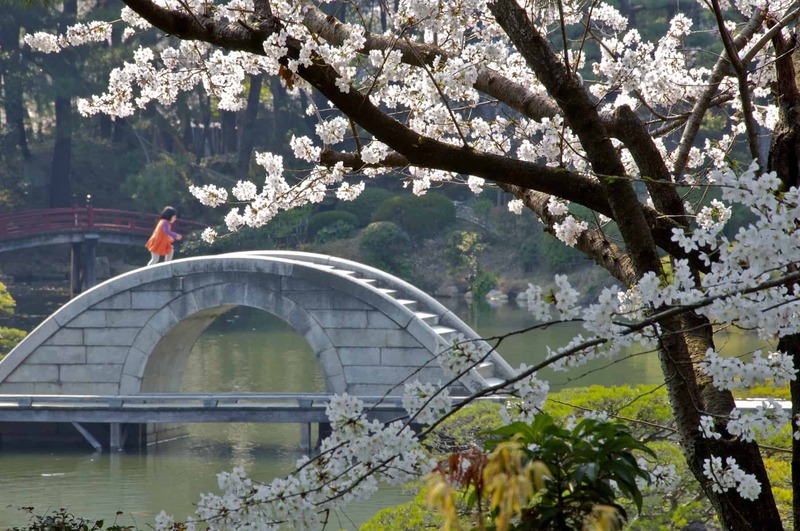 The sakura matsuri at Hiroshima City Botanical Gardens runs throughout April and, with more varieties of cherry trees than anywhere else in the prefecture, you can usually count on color right the way through. On weekends during the first half of April they also open at night when the cherry trees are illuminated, along with other impressive light and candle displays. The link for the Hanami Map is not working. Thanks Klaus. We’ll fix the link asap. Thanks! We’ll fly to HIJ in 2 days and really hope for good weather and a nice hanami! Your list of spots will be really helpful! After a rainy weekend, the weather is supposed to brighten up from Monday. Please check out our latest GetHiroshima Magazine online and pick up a copy once you arrive. Hope you enjoy your time in Hiroshima. We miss Hiroshima & Iwakuni!